I was part of a privileged preview of Burger King’s first outlet in India and I have to say the kind of effort they have put into making it a sure shot success is mind-boggling. From travelling to various cities in India to discover what people want, to doing group surveys across our demographic and creating a menu of products suited to the Indian market in just under a year – Burger King has taken efficiency to another level. 1. It launched on the 9th of November, 2014 at the 2nd floor of Select City Walk, Saket. 4. The Tandoori grill chicken burger has been created by Chef Vicky Ratnani – it is everything we could want – succulent tandoori chicken + Mint chutney (mayo) + onion rings (pyaaz) all stuffed in a bun. What more could we ask for? 6. The kitchen is clearly divided into vegetarian and non-vegetarian sections with colour coded tongs and separate prep areas like all QSR outlets. Vegetarians can rest assured that no French fries are being fried in chicken nugget oil. 7. It really does ‘take two hands to handle a Whopper’ – irrespective of your gender. 8. 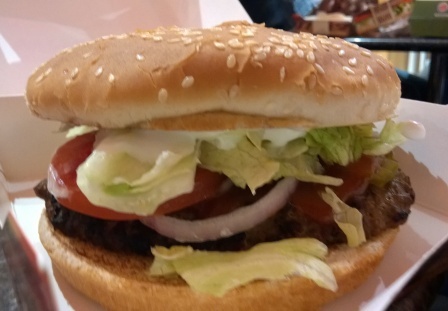 The service is super fast – they take 30 seconds or less to assemble each burger! 9. When Burger King says chicken or mutton burgers, they mean 100% chicken/mutton patties. No fillers whatsoever. Just pure delicious, juicy meat. 10. Apart from the burgers, there are fries and chicken strips called Cravers and a couple of shakes and slush which go brilliantly with the burgers. The blue slush is a winner. 11. There are 13 burgers on the menu so have a ball and try out a different one each time because here is a place where the burger is King!